We’re not in Oklahoma any more … we’re in Idaho? Toto, I don’t think we’re in … Oklahoma … any more. Coming off the heels of ABC News map mistake last week that relabeled Kansas as Oklahoma, apparently it’s Oklahoma’s turn to get slighted this week. 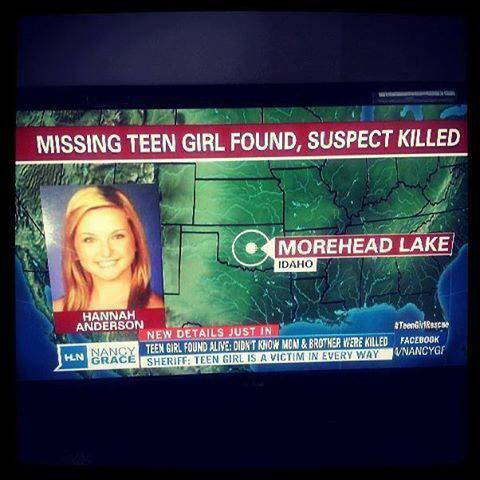 A sharp eyed “Nancy Grace” viewer notice the show moved Morehead Lake, Idaho, where captive Hannah Anderson was found, smack dab in the middle of Oklahoma. That viewer posted the photo to the show’s Facebook page and several additional viewers, mainly from Idaho, have chastised the show on the page as well.